A refurbished Hampden Park has "great potential" and Scotland fans will return in greater numbers if the team's fortunes improve, believes Craig Brown. 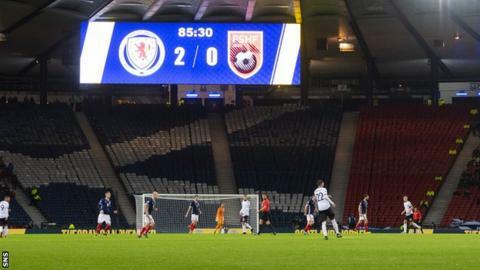 The country's longest-serving manager is "delighted" the Scottish FA have secured a £5m deal to buy the ground from current owners Queen's Park. Poor crowds attended recent games with Belgium and Albania and chief executive Ian Maxwell admits it "needs improved". "I do think a refurbished Hampden would be an attraction," Brown said. "Internally, down in the dressing-room area, there is a hydrotherapy pool, a gymnasium, a first-class indoor warm-up area. The dressing rooms are excellent, good lockers for the players. Everything is well appointed down there. "The fans don't see that but round the stadium, there are requirements in terms of refurbishment. Behind the goals it could be brought in. "I think there is great potential in Hampden. I am quite sure the powers that be are capable of improving it to make it an attraction for the Tartan Army to attend. "But it is not so much Hampden, it is how the team is doing as well which will determine whether the fans turn up or not." Where is the grand plan to redevelop Hampden? Brown, 78, commended the contribution of businessmen Lord Willie Haughey and Sir Tom Hunter, whose £2.5m donation helped the SFA meet the £5m cost, which avoided a move to Murrayfield instead. Haughey says the wealthy duo "will probably give them a bit more, although we don't know yet how much". "They are two great guys and it is wonderful they contributed so willingly to do this," Brown added. But Roger Mitchell, who was chief executive of the Scottish Premier League in 1998 when investment in Hampden was made by the then Scottish government, has criticised the SFA's decision to stay put. "I would be a hypocrite if I changed my mind after 20 years of saying Hampden was a dreadful stadium," he told BBC Scotland. "This is like Groundhog Day for me. I remember begging the then Minister of Sport, Sam Galbraith, to not do the investment - 20 years back - with tax-payers' money. It is just a little bit sad. "I feel a bit sorry for Ian Maxwell. This was started under his predecessor [Stewart Regan]. The tender was set up to exclude the best solution, which was to take it round the country. "The decision was made between two sub-optimal stadiums, Hampden and Murrayfield. The national team needs to go around the country." Celtic captain Scott Brown, who recently retired from Scotland duty, is another advocate of taking internationals to different grounds, saying Hampden is "possibly one of the worst stadiums I have played in for atmosphere." Maxwell says the SFA is committed to investigating the model used by German club Stuttgart, who redeveloped the Mercedes-Benz Arena by bringing in both goal-side stands, at an estimated cost of £56.5m. Paul Fletcher, a stadium expert who served as chief executive at Huddersfield and Bolton when they built new arenas in the 1990s, and was also commercial director of the new Wembley Stadium, says the SFA should "get rid of" the athletics track at Hampden. "It just doesn't work, it compromises the views, it compromises everything," he says, while warning the governing body it will be "very, very expensive" to move the two stands in. "It's not easy, it's very hard, but the two stands behind the goal are obviously 40 metres away from the action, so it's those two that could probably do with coming down," he told BBC Scotland. "The other two on the long side will probably be OK. It cost nearly a billion pounds to replace Wembley Stadium, so it's not going to be a cheap experience, but it needs doing. "Football is a massive industry, it's the biggest sports business on the planet, and it's a passionate sport for Scotland. The national team needs a fantastic stadium to play in." Fletcher urged the SFA to consider the commercial possibilities when exploring ideas to redevelop Hampden. "Clearly what you don't want is a single-purpose building just for sport," he added. "You could integrate student accommodation, shops, offices. "There are so many multi-uses which means the building could make a profit through the week rather than just when there's an international match. "There are lots of great examples all around the world now that Scotland can learn from and integrate these ideas into a new stadium."